Yesterday I was walking with a friend in Causeway Bay, when she suddenly pointed at one of the countless colourful billboards that decorate the shopping district's building facades and said, "That's the bookstore of the missing booksellers!". 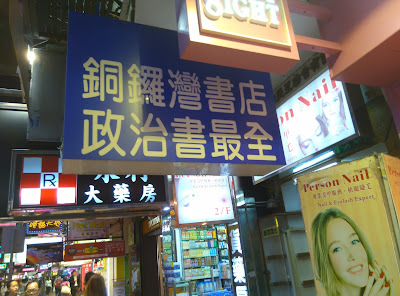 The bookstore is called "Causeway Bay Books" (銅鑼灣書店) and it's located on the second floor of a building on Lockhart Road. I and my friend went upstairs and, of course, the bookstore was closed. 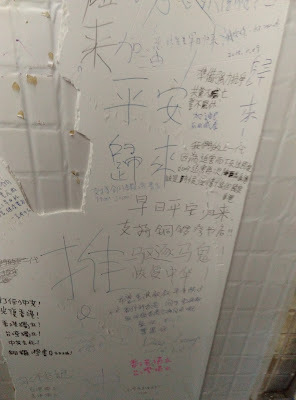 Next to the entrance door there were messages written on the wall by sympathetic citizens. My friend had actually gone to Causeway Bay Books last year and had met one of the owners, when that was still a thriving business. While we were there, two mainland tourists arrived and started to take pictures. It seems that the news of the booksellers' disappearance has spread across the border despite censorship. 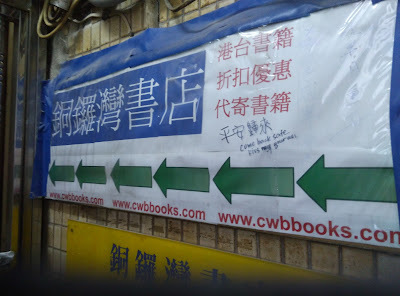 Causeway Bay Books was founded in 1994 by Lam Wing-gei (林榮基), and it specialised in books about political leaders of the People's Republic of China. The bookstore was popular among mainlanders who wanted to have access to information about their rulers, whose biographies are usually censored and embellished by mainland authorities to fit into the image the Communist Party wants to project towards its subjects. 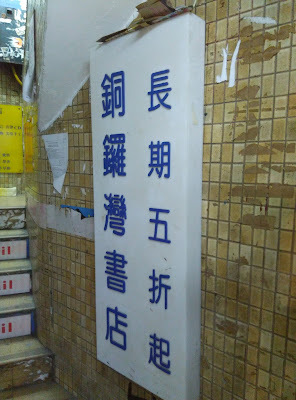 The bookstore's titles include: "Jiang Zemin defeats Xi Jinping" (江澤民大勝習近平), "2017- Xi Jinping's Downfall" (2017習近平崩潰) and "The Secret War Between Peng Liyuan and Song Zuyin" (彭麻麻暗鬥宋貴妃). 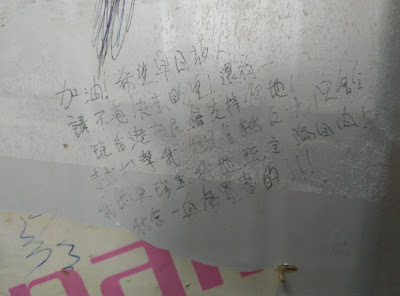 But exactly because of the salacious and irreverent content of the books, Causeway Bay Bookstore was a thorn in the side of the Communist Party. For some time people thought that under the "one country, two systems" framework Hong Kong would continue to be a safe haven for intellectuals, as it had been under British rule. But now it appears that Hong Kong citizens no longer enjoy the protection that the laws and judicial system of the Special Administrative Region are supposed to grant. Gui Minhai (桂民海, 51), a mainland-born Swedish citizen. He disappeared from his home in Pattaya, Thailand, in October 2015. Gui published gossip books about the private lives (and vices) of senior Chinese Communist Party leaders. It has been suggested that his abduction may be part of "Operation Fox Hunt", launched by Xi Jinping in 2014 with the aim of forcibly repatriating Chinese citizens wanted by the government, including political dissidents. Gui surprisingly resurfaced in a televised "confession" broadcast on China Central Television (CCTV) on January 17. He claimed that he had returned to the mainland because he "missed his homeland" and because he wanted to face charges of drunk-driving that date back to 2003, when he allegedly hit and killed a woman in the city of Ningbo. Cheung Chi-ping (張志平, 32), assistant general manager of Mighty Current. He disappeared from mainland China in October 2015. 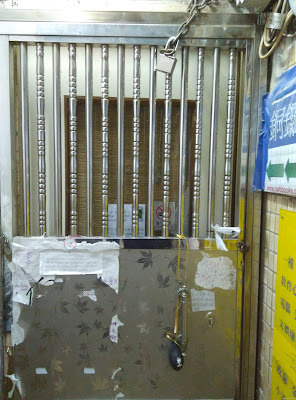 Communist authorities claimed that he was ordered by Gui Minhai to smuggle 4,000 banned books to the mainland. At the end of February he was interviewed by Hong Kong-based Phoenix Television, one of the few private broadcasters that are allowed on the mainland. "I voluntarily accept the legal punishment", he said after admitting to having helped Gui Minhai in "illegal activities". 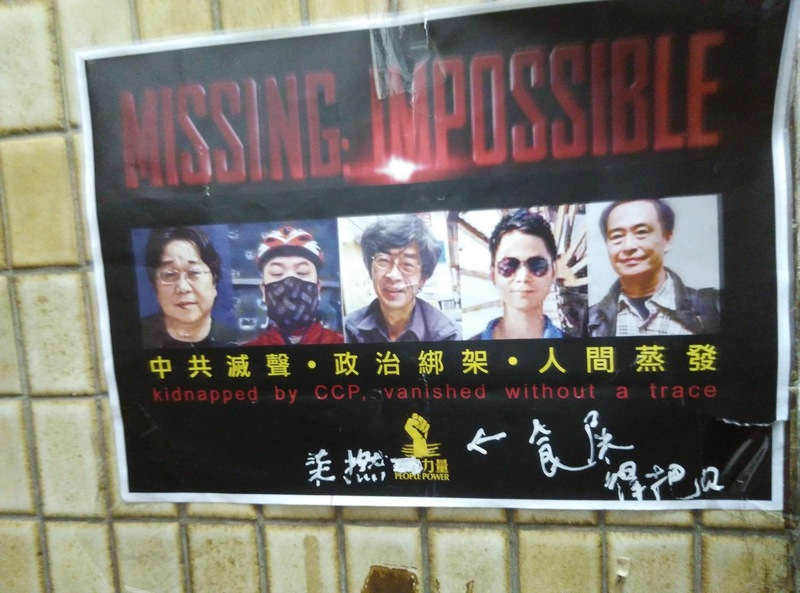 Cheung resurfaced in Hong Kong on March 6 and asked the Hong Kong police to drop the missing person investigation that had been filed after his disappearance. 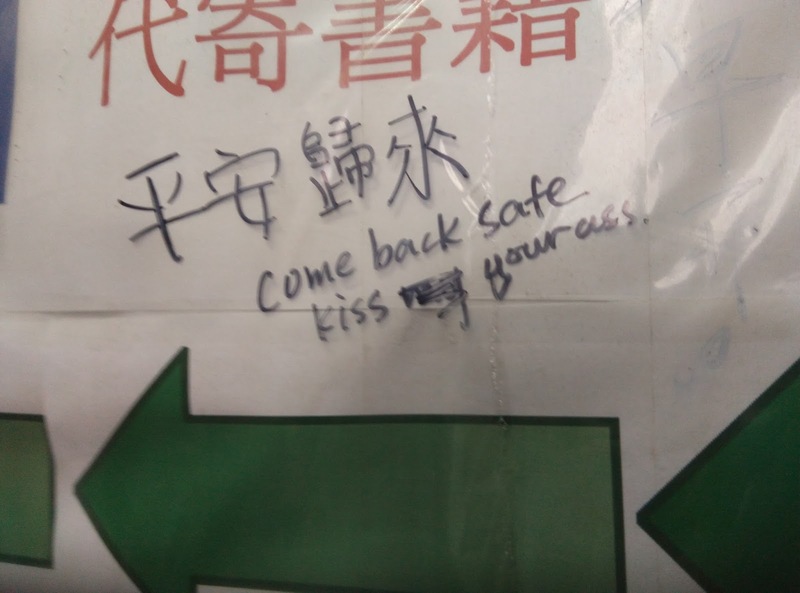 He reportedly went back to the mainland hours afterwards. Lam Wing-gei (林榮基, 61) is the founder and manager of Causeway Bay Books. He disappeared in October and is the only one of the four Hong Kong residents who has not yet returned from the mainland. 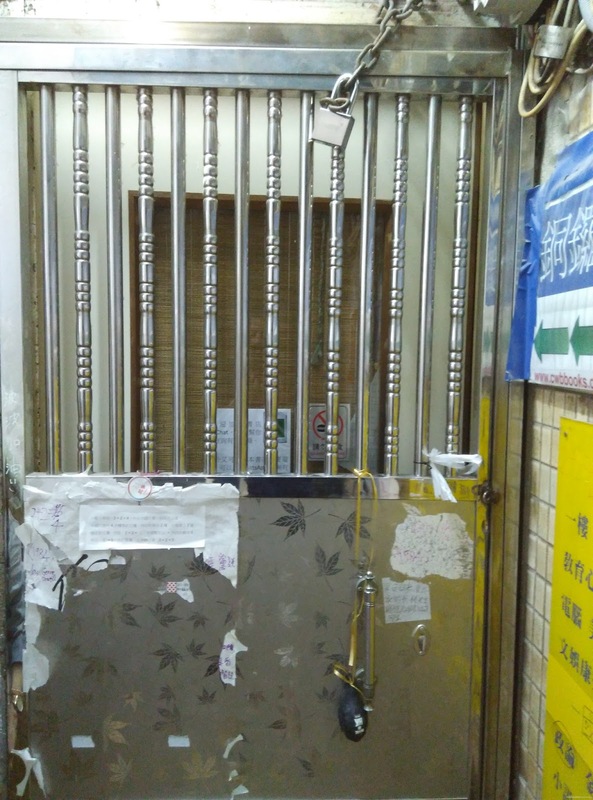 Lui Bo (吕波,47), Mighty Current shareholder and general manager, also disappeared from the mainland in October. Lui also admitted to smuggling banned books to the mainland in a televised interview broadcast on Phoenix Television. Lee Bo (李波, 65), is a shareholder of Causeway Bay Books. He holds a British passport. 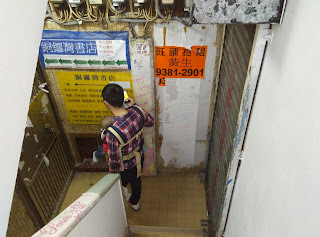 In late December he was last seen in Chai Wan before going missing. On January 4 he faxed a message to a bookstore employee. "Since I am in urgent need to handle the related issue", he wrote, "and as it cannot be told to the outside world, I have returned to the mainland by my own method to assist the investigation by related authorities – it may take some time". On January 18 the Hong Kong police received a reply letter from the Interpol Guangdong Liaison Office of Guangdong Provincial Public Security Department, confirming that Lee Bo was on the mainland. At the end of February Lee Bo gave an interview to Phoenix Television, claiming that he had "smuggled" himself to the mainland. "After what happened to Mighty Current, I wanted to secretly go to the mainland to resolve whatever issues there were with the company and then secretly go back to Hong Kong", he said. "I came to the mainland to assist with the judicial investigation, and I had to incriminate some people. I was really scared that if these people found out, they will cause harm to me and my family, so I didn’t want anyone to know, and I didn’t want to leave any immigration records. So I chose to smuggle [to the mainland]". He added that he would renounce his British passport. On March 24 Lee entered Hong Kong via the Lok Ma Chau border using his HKID. 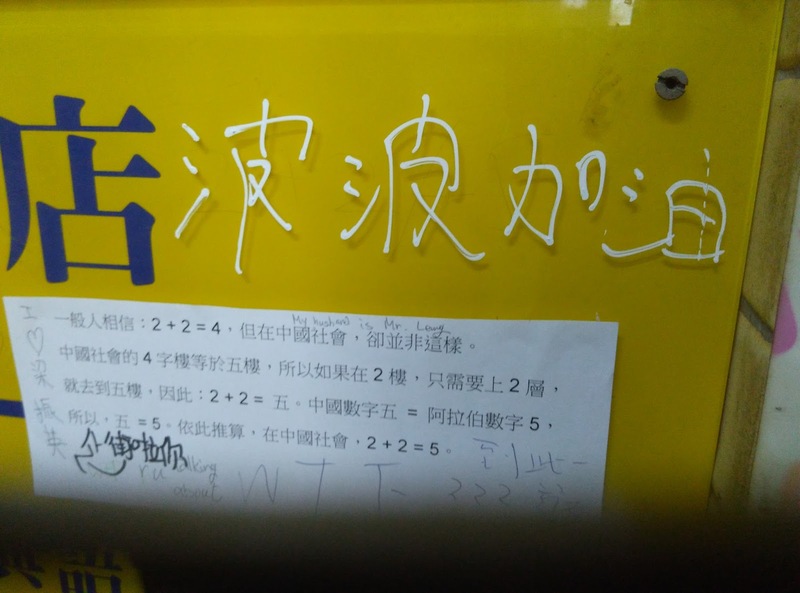 He asked the police to cancel his missing person report and returned to the mainland less than 24 hours later. He re-emerged in Hong Kong on March 30, went walking near his home in North Point and took selfies, which he later posted online. "It feels so good to be back home", he wrote. "I went to the office, walked around on the street, went to the bank, got some snacks from the supermarket, totally autonomous and without interference from anyone. Life is all well, I'm so happy! Thank you to everyone for caring about my family, I am so grateful!" 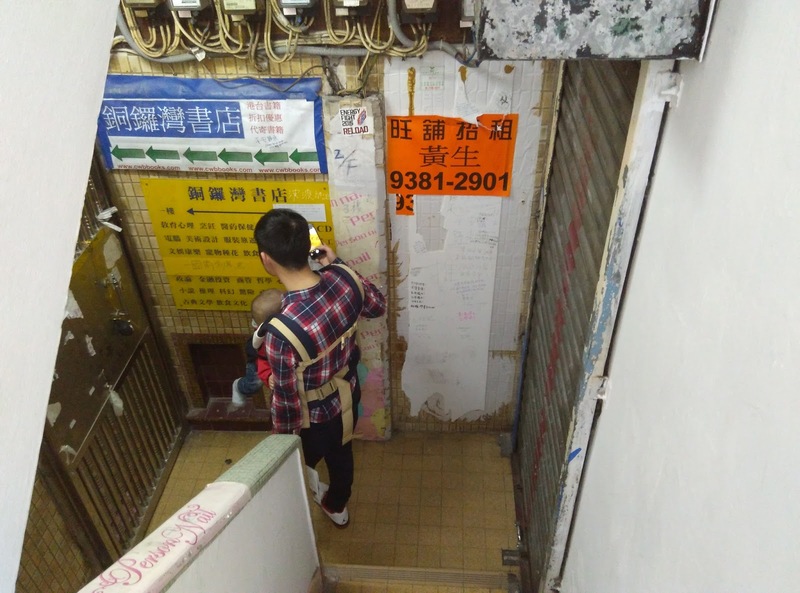 The case of the missing booksellers has shocked Hong Kong, showing that no one who dares challenge the Communist Party is safe from political persecution. Even Hong Kong Chief Executive Leung Chun-ying, an unpopular leader who is often seen as a puppet of Beijing, said at a press conference that "it is unacceptable if mainland legal agencies enforced law in HK as it is against the Basic Law".